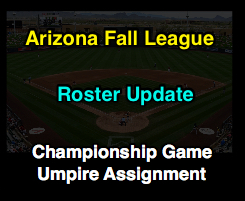 The following four minor league umpires officiated Saturday's Arizona Fall League Championship Game at Scottsdale Stadium. The 2018 AFL staff featured 13 officials from Triple-A Baseball's International (IL) and Pacific Coast (PCL) Leagues (and two umpires from Nippon Professional Baseball). HP: John Bacon, IL. 2017 Spring, 2018 MiLB Postseason. 1B: Dan Merzel, IL. 2017 Spring, 2018 MiLB Postseason. 2B: Jeremy Riggs, IL. 2018 MiLB Postseason. 3B: Bryan Fields, PCL. 2017 AFL, 2017 AFL Championship Game.